Commuters across the UK will be coming face to face with Clipper 2015-16 Race crew at over 600 London Underground and national railway stations over the coming fortnight following the relaunch of our inventive 50:50 advertising campaign. Crew members Alex Laline (ClipperTelemed+), Ana Downer-Duprey (Visit Seattle), Memnia Theodorou (GREAT Britain) and Junior Hoorelbeke (LMAX Exchange), who all competed in the last edition of the race, star in the eye-catching recruitment campaign which aims to inspire everyday people to ‘achieve something remarkable’. Katharine Schäfli, Head of Brand for the Clipper Race, says: “This is our third year running the ‘50:50’ campaign. 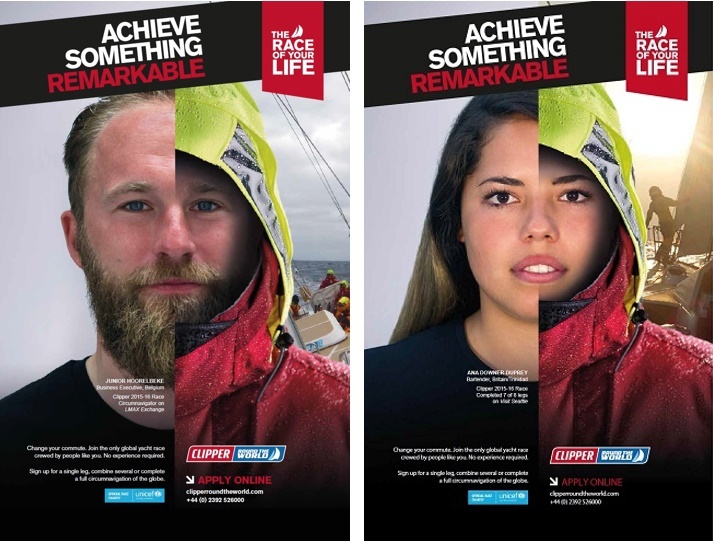 The idea is powerful – it clearly demonstrates how people from all walks of life can change when they become ocean racers on the Clipper Race. 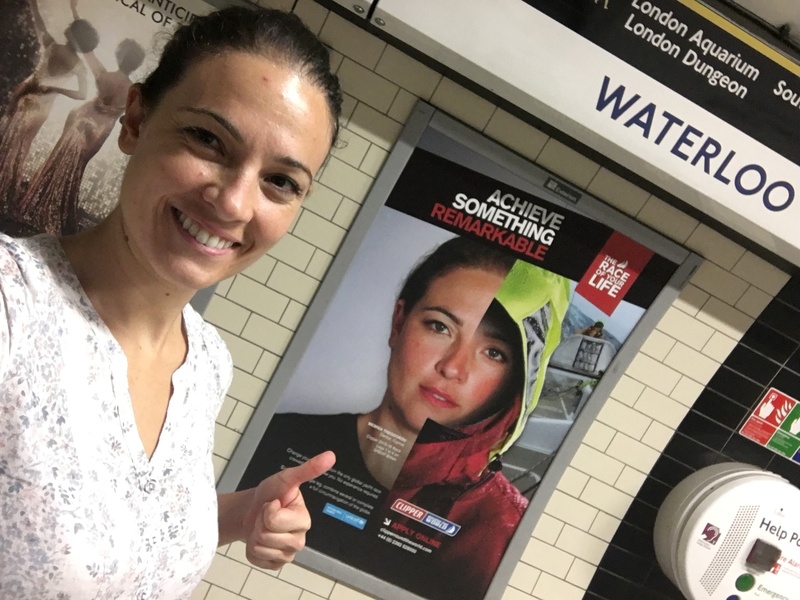 Memnia Theodorou [pictured above], who became the first Cypriot woman to sail from the UK to Australia when she completed the first four legs of the eight stage race, says: “I myself actually signed up to do the Clipper Race after seeing a 50:50 campaign poster in Shepherd's Bush underground station. Every time I saw the posters I kept gauging the before and after changes of the girl's face and thought what a brave decision it was for her to take part in this race. “The following year I came across the GREAT Britain boat poster, which said, "You?" That's when I thought ‘this is for ordinary people like me, why not?’ so I applied!” explained Memnia. Alex, from Spain, was only 19 at the Race Start in 2015 and was the youngest round the world crew member on the race. He said: “It feels very strange to know my face is all over the London Underground! I haven't been to London many times, but I had seen the Clipper Race posters every time I visited. “It makes me feel proud of what my teammates and I did,” said Alex, whose poster image has already been snapped and shared by Mission Performance circumnavigator James Shepherd in London. “The Clipper Race made me grow up as a person, it made me understand a lot of things that I would have never have understood if I hadn’t done it. I feel blessed thinking that people could feel inspired by seeing my poster and realise, ‘I can do this, this is the moment to see where my limits are and learn who I really am’,” Alex added. 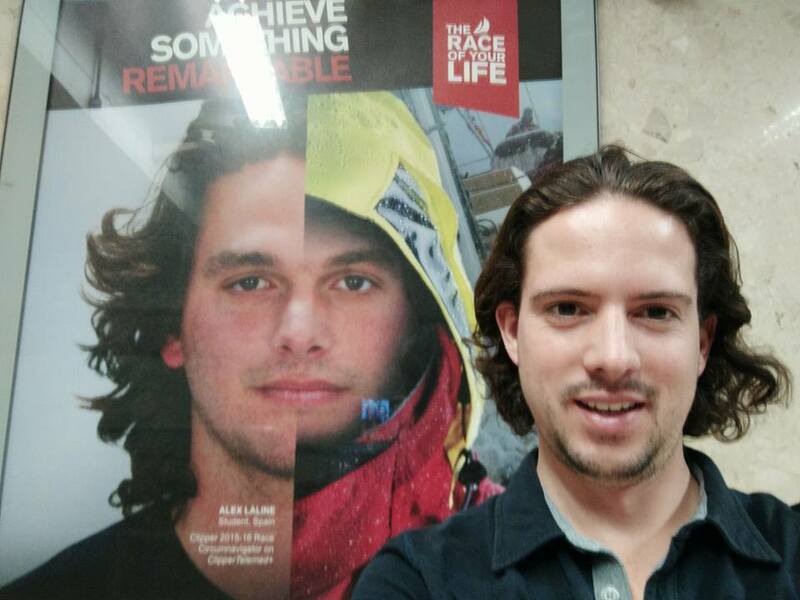 With the posters on display for the next fortnight, circumnavigator Junior Hoorelbeke, from Belgium, reflects on life before the race and admits it feels strange to think it is now his image that will be inspiring future generations of crew to take up the challenge. “Life is too short to sit behind a desk every single day. Before the Race Start I stayed in London for two weeks and sat between the standard commuters of the London Underground. Although I normally also am one of those suits, I felt for them. They did not seem happy at all, while I could not stop smiling, knowing the adventure I was going to embark upon. Junior, Alex and Ana also feature in the Watch My Story: Best Bits video released today along with fellow Clipper 2015-16 Race crew members Catherine Anderson (Garmin), Kiki Bakker (GREAT Britain), Tzen Chia (Unicef), Jason Chan (ClipperTelemed+), Stephen O’Connor and Vanessa Jubenot (both LMAX Exchange). Watch it here. Aldgate East; Amersham ; Angel; Archway; Arsenal; Barbican; Bank; Baker Street, Balham, Bayswater; Belsize Park; Bethnal Green; Blackfriars; Blackhorse Road; Bond Street; Brixton; Chancery Lane; Charing Cross; Embankment; Elephant & Castle; Earl’s Court; Euston; Finsbury Park; Gloucester Road; Goodge Street; Green Park; Highbury & Islington; Holborn; Kennington; King’s Cross; Liverpool Street; London Bridge; Maida Vale; Notting Hill Gate; Old Street; Paddington; Seven Sisters; Shepherd’s Bush; South Kensington; Stockwell; St Paul’s; Turnpike Lane; Vauxhall; Walthamstow Central; White City; West Ham; Waterloo; and Westminster. Wolverhampton; West Bromwich; Birmingham; Aberdeen; Altrincham; Blackburn; Bristol Parkway; Cardiff; Cheltenham Spa; Dundee; Liverpool; Manchester; Exeter; Gloucester; Glasgow; Halifax; Harrogate; Edinburgh; Newport; Motherwell; Plymouth; Swindon; Slough; Taunton; Torquay; Newcastle; and Chichester. The poster campaign will last until 24 October. If you spot any of the crew on your travels feel free to share on social media with the hashtag #ClipperRace. The Clipper 2017-18 Race starts next Summer and is already 70 per cent full, with crew already undergoing their training at our Hampshire, UK, and Sydney, Australia, HQs. Click here to find out more about signing up and being part of the adventure for the eleventh edition of the world’s largest ocean race.